Introduction: There are inconclusive data about the potential delay of procedure time in emergent percutaneous coronary intervention (PCI) by radial compared with femoral approach in patients with ST-segment elevation myocardial infarction (STEMI). Aims: The purpose of the current study is to conduct a comprehensive meta-analysis of controlled randomized trials (CRTs) comparing the procedure time in STEMI patients undergoing emergent PCI with radial versus femoral access. Methods: Formal search of CRTs through electronic databases (Medline and PubMed) was performed from January 1990 to October 2014 without language restrictions. Mean difference (MD) of procedure time was evaluated as overall effect. Results: Twelve studies were included with 2052 and 2121 patients in radial and femoral group, respectively. Variability in the definition of procedure time was found with unavailability of a precise definition in 41.6% of studies. When all studies were included, no significant longer procedure time in radial approach was detected (MD [95% confidence interval [CI] = 1.6 min [−0.10, 3.3], P = 0.07, P het = 0.56). After deleting RIVAL trial, procedure time was significantly longer in radial group (MD [95% CI] = 1.5 min [0.71, 2.3], P < 0.001, P het = 0.20). Meta-analysis of three studies with similar definition of procedure time showed (MD [95% CI] = 1.26 min [−0.43, 2.95], P = 0.14, P het = 0.85). Conclusions: Although the procedure time in STEMI patients undergoing emergent PCI by radial access is generally comparable with femoral approach, there is an absence of uniformity in its definition, which leads to divergent results. A standardized definition of procedure time is required to elucidate this relevant matter. Primary angioplasty (PA) for ST-elevation acute myocardial infarction (STEMI) is the most beneficial reperfusion therapy in terms of survival comparing with intravenous thrombolysis as demonstrated by multiple large studies., Besides, PA has shown an additional advantage in reducing bleeding complication compared with thrombolysis therapy. There is a direct and exponential association between the time from onset of symptoms to coronary artery restoration flow and patient survival. Thus, any time delay has a strong and negative implication in prognosis of STEMI patients undergoing PA. Although femoral approach has been traditionally the routine access for percutaneous coronary intervention (PCI) and PA, more recently, radial approach has gained an increasing use due to a significant decrease in site vascular complication and hospitalization stay. Moreover, radial access in STEMI patients undergoing PA has been associated with greater survival rates compared with femoral approach. Despite these clinical benefits, some interventionists are hesitant in using this access for emergent PCI because of its potential association with a longer procedure time. The procedure time of PA has been compared in radial versus femoral approach in many observational and randomized studies with inconclusive results.,, A number of meta-analyses have compared outcomes of radial versus femoral access in emergent PCI, but the procedure time was often considered as a secondary end point. Besides, not all meta-analyses have delimited their research to randomized trials. Taking into account these limitations, we considered necessary to conduct a meta-analysis with only controlled randomized studies published so far to clarify the difference of procedure time between radial and femoral approach in the context of STEMI patients undergoing emergent PCI. We searched for controlled randomized trials (CRTs) comparing radial versus femoral approach in STEMI patients undergoing emergent PCI. We scanned PubMed, EMBASE, the Cochrane Central Register of Controlled Trials, Clinical trials.gov from January 1990 to October 2014. Furthermore, oral and/or slide presentation was searched in transcatheter coronary thera (www.tctmd.com). Different combinations of the following keywords were used: “radial access,” “transradial,” “Radial vs. Femoral,” “percutaneous coronary intervention,” “primary angioplasty,” “emergent PCI,” “acute myocardial infarction,” and “ST-segment elevation myocardial infarction.” No language restrictions were enforced. In addition, we hand searched the references of retrieved articles and used PubMed- related articles to identify studies not found by primary search strategy. We performed a systematic review in accordance with QUOROM statements. The inclusion criteria were (1) randomized studies comparing radial versus femoral approach, (2) patients suffering from (STEMI). STEMI undergoing emergent PCI, and (3) procedure time reported in all studies. The exclusion criteria were (1) nonrandomized studies, (2) unspecified myocardial infarction type, and (3) lack of procedural time information. Mean and standard deviation of procedure time in femoral versus radial group of each study were extracted. When the procedure time was not defined or available in a trial, we contacted the main investigator to get the data of interest. When procedure time was reported as median, Hozo et al. method for mean and variance estimation from median was used. Mean difference (MD) was calculated and pooled to measure the global effect. Study heterogeneity was estimated with Chi-square and P < 0.10 indicated the presence of heterogeneity. When fixed effect model revealed the absence of homogeneity, random effect model was used for global MD estimation and pooled with the inverse of variance plus the additional parameter of τ2 which indicates the variability between studies. Between-study heterogeneity was calculated with I2 = ×100 ([Q − df]/Q) where Q is Chi-square statistic and df is its degree of freedom. I2 is the percentage of variability in the estimation of parameter due to heterogeneity between studies. Meta-regression analysis was utilized to identify the independent variables which could potentially have contributed to the presence of heterogeneity of the effect estimation. Besides, we performed an analysis of influence and sensitivity to find the weight of each study in the contribution of heterogeneity. Publication bias was investigated by Egger method and a P < 0.10 value was considered as bias indicative. All estimations were performed with the statistic package Stata 13 (StataCorp; United States). A total of 14 randomized studies were identified as appropriate for the meta-analysis.,,,,,,,,,,,,, Two trials were excluded because of unavailability of data regarding procedure time., In Wang et al. trial, an emergent PCI was carried out within 12 h after thrombolytic therapy, and in RADIAL-AMI trial, both PA and rescue angioplasty were included in the study. In FARMI  trial PA, rescue angioplasty and facilitated PCI were considered eligible for the study. RIVAL trial  included both STEMI and non-ST-elevation acute coronary syndrome and subgroup of STEMI with 955/1003 in radial versus femoral access was used for the outcome of the current meta-analysis. In this trial, fibrinolytic therapy was used in 12% of patients within STEMI group. In the remaining trials included in the meta-analysis, all patients with STEMI underwent PA.
All studies were published in peer-reviewed journals. Finally, a total of 12 studied were included in the meta-analysis with a total of 4173 patients, 2052 and 2121 in radial and femoral group, respectively [Figure 1]. 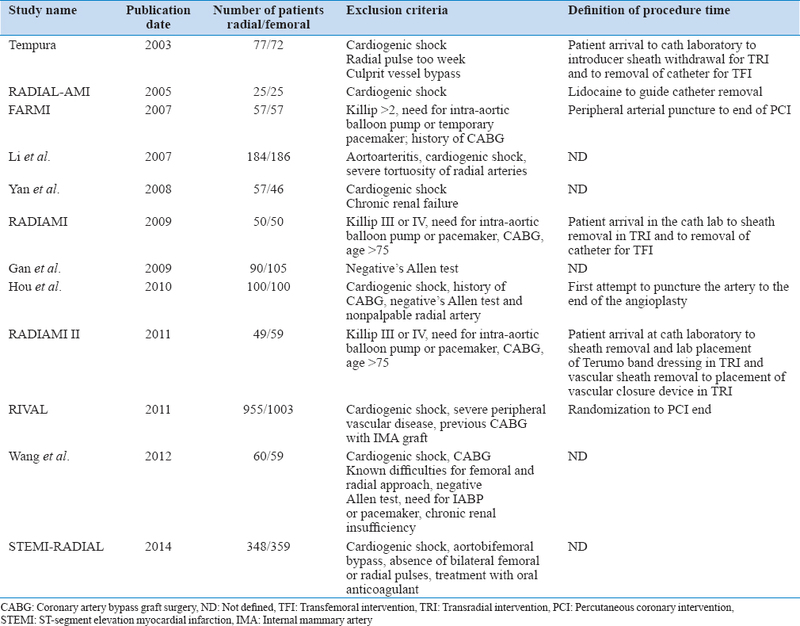 Characteristics of each trial are described in [Table 1]. In 41.6% of all studies, there was not a clear definition of procedural time interval. MD of procedure time estimated by random effect model showed a slightly longer interval in radial group although this difference was not statistically significant (MD [95% confidence interval [CI] = 1.6 min [−0.10, 3.3], P = 0.07, P het = 0.56) [Figure 2]. 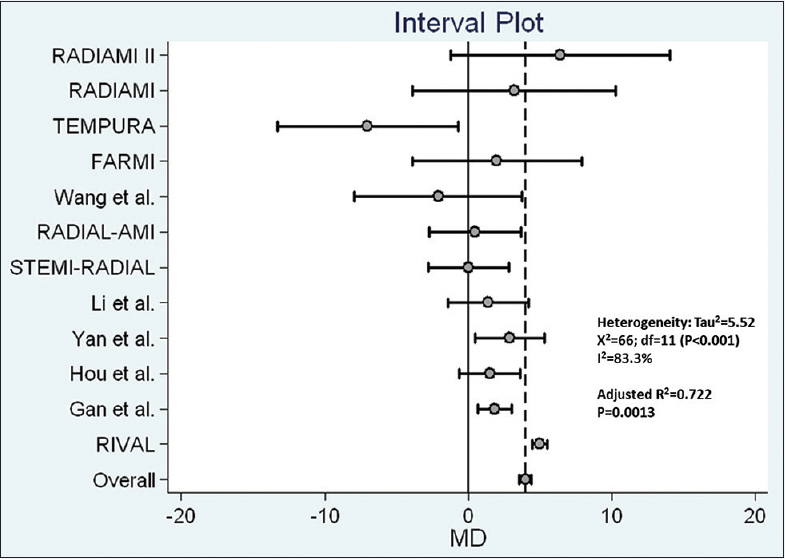 Meta-regression analysis showed that sample size both in radial and femoral group could significantly predict 72% of variability of MD observed in the meta-analysis [Figure 3]. As the definition of procedure time was missing in a few studies, the influence of this categorical variable could not be measured by meta-regression analysis. 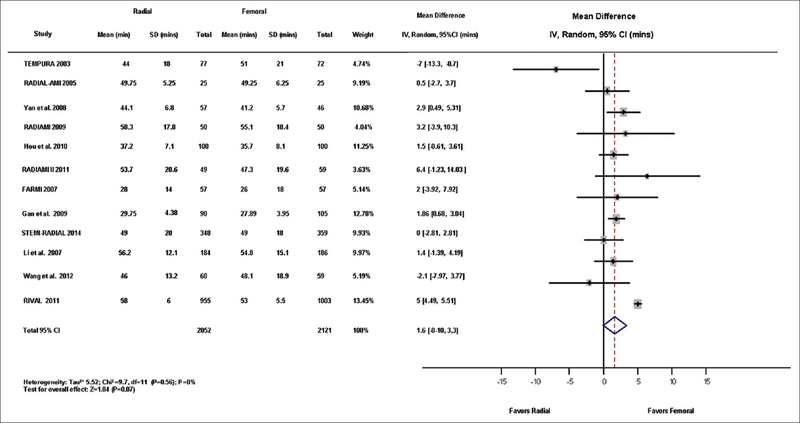 Analysis of influence identified RIVAL trial as the main contributor of heterogeneity and excluding the latter trial the heterogeneity could be eliminated (P = 0.20 >0.10) although this trial had an important weight and its elimination meant a reduction of 62% of estimated effect in fixed effect model [Table 2]. Egger method detected bias publication which disappeared once RIVAL study was deleted. Fixed effect model after RIVAL trial elimination showed nonsignificant P value (0.20) of homogeneity test and with a significant MD of procedure time of 1.5 min in favor of femoral approach (P < 0.001) [Table 3]. The analysis of three studies with similar definition of procedure time, consisting of interval from artery puncture to the end of PCI, revealed a nonsignificant difference in procedure time between radial and femoral approach (MD [95% CI] = 1.26 min [−0.43, 2.95], P = 0.14, P het = 0.85) [Figure 4]. The present meta-analysis suggests that among patients with STEMI undergoing an emergent PCI, the procedure time in radial access is slightly superior to that with femoral approach, but this difference is not statistically significant. Besides, our review shows an absence of a common definition for procedure time among studies published so far, thus a universal definition of this interval is required to achieve more reliable results. Since radial access began to be used both in coronary angiography and therapeutic procedure,, many advantages such as a decrease in the incidence of access site bleeding and other vascular complications, patient comfort improvement, and early ambulation were found over more conventional transfemoral route. These benefits could be more advantageous in the setting of emergent PCI for STEMI where the use of thrombolysis, glycoprotein IIb/IIIa inhibitors, and other antithrombotic agents could increase the risk of access site bleeding up to 23% of patients. However, these advantages can potentially be counterbalanced with the association of radial access with more occurrence of puncture failure, difficulty for complete the complex procedure, and the need for special and longer training period with regard to femoral access. All these observations raise the concern of the usefulness of radial approach for emergent PCI in STEMI. The use of radial approach for coronary angiography and PCI has increasingly attracted the interest of interventionists, and more complex intervention are being done by this access as the level of operator experience increases. In relation to learning curve and operation time, it is well known that the average duration of the procedure performed by radial approach could be regularly decreased with operator experience. Consensus document on the radial approach in percutaneous cardiovascular intervention  proposed the stepwise approach for the use of radial access starting with diagnostic procedure in male first and then in female patients with good radial pulse <70 years old as the first level and to reserve the utilization of radial access for STEMI patients as the third level. At this level, the operator should have done around 300 cases through radial access. Comparison of procedure time in STEMI patients undergoing emergent PCI with radial versus femoral access has been done in other meta-analysis as a secondary end point. Karrowni et al. in a meta-analysis of nine CRTs concluded that radial approach in STEMI patients took a small longer time (1.5 min) compared to femoral access although this difference was statistically significant. In contrast to the latter study which included 2046 patients, in the present meta-analysis, the sample size has been 4173 patients. Pang et al. in a recent meta-analysis for evaluation of safety and efficacy of transradial PCI in STEMI patients compared the operational time between radial and femoral approach in three studies with a total of 1787 patients and revealed that the procedure time was 6.04 min shorter in radial group, difference which was statistically significant. It should be emphasized that in this meta-analysis with the exception of Wang et al. trial, in the remaining studies, the patients were not randomly distributed to arterial access. In the current study, we found an absence of a common definition for the operational time among different studies included in the meta-analysis. This issue has not been remarked in previous systematic reviews and we consider that along with sample size differences and a few intrinsic the characteristics of the study design could have contributed to the presence of heterogeneity mentioned in this manuscript. We highlighted the significant contribution of RIVAL trial  to the heterogeneity found in fixed effect model. Although this study had an important weight in the estimation of MD, it is worth pointing out some specific aspects of the study design. In the latter trial, the minimum level of operator expertise for radial approach was fixed at fifty procedures during the previous year. The authors argued that higher level of experience could limit the external validity of the study. In most of the remaining studies included in our meta-analysis, the operator expertise was marked higher than that considered in RIVAL trial. This aspect together with sample size, the biggest in RIVAL study, has probably differentiated this trial from others. It is noteworthy that with the exception of Gan et al., other trials excluded patients with cardiogenic shock, and for this reason, we cannot extrapolate our results to this specific subgroup with hemodynamic instability. This is the most comprehensive meta-analysis performed so far which compares the procedure time in STEMI patients undergoing emergent PCI including only CRTs published in this field. Taking into account that the procedure time has not homogeneously defined in all studies, the use of radial access is associated with a slightly longer operational time of 1.6 min. The main limitation of this study is the absence of a common definition for procedure time between different studies which could have probably contributed in part to the heterogeneity found in the meta-analysis. Unfortunately, the real contribution of this factor to the presence of heterogeneity could not be statistically quantified due to unavailability of a precise definition for operational time in a few studies. This limitation should be resolved in the future by standardizing the procedure time definition. In this sense, the best interval which could adequately represent the access influence on procedure time is probably the interval from the first attempt to arterial puncture to the end of the PCI. The meta-analysis of three studies whose definition of procedure time resembled to this interval showed a nonsignificant difference between radial and femoral approach, but these trials did not include a large number of patients. Other limitation of our study is the difference in sample size between trials which has influenced the absence of homogeneity. The results of our study could not be extrapolated to the subgroup of patients with cardiogenic shock, and this aspect is a limitation in terms of external validity. The current meta-analysis suggests that the use of radial approach in STEMI patients undergoing emergent PCI does not significantly increase the procedure time although this interval has not been uniformly defined among different studies. A standardized definition of procedure time is required to clarify this matter. Nielsen PH, Maeng M, Busk M, Mortensen LS, Kristensen SD, Nielsen TT, et al. Primary angioplasty versus fibrinolysis in acute myocardial infarction: Long-term follow-up in the Danish acute myocardial infarction 2 trial. Circulation 2010;121:1484-91. Cucherat M, Bonnefoy E, Tremeau G. Primary angioplasty versus intravenous thrombolysis for acute myocardial infarction. Cochrane Database Syst Rev 2003;(3):CD001560. De Luca G, Suryapranata H, Ottervanger JP, Antman EM. Time delay to treatment and mortality in primary angioplasty for acute myocardial infarction: Every minute of delay counts. Circulation 2004;109:1223-5. Gan L, Li Q, Liu R, Zhao Y, Qiu J, Liao Y. Effectiveness and feasibility of transradial approaches for primary coronary intervention in patients with acute myocardial infarction. J Nanjing Med Univ2009;23:270-4. Jolly SS, Yusuf S, Cairns J, Niemelä K, Xavier D, Widimsky P, et al. Radial versus femoral access for coronary angiography and intervention in patients with acute coronary syndromes (RIVAL): A randomised, parallel group, multicentre trial. Lancet 2011;377:1409-20. Kim MH, Cha KS, Kim HJ, Kim SG, Kim JS. Primary stenting for acute myocardial infarction via the transradial approach: A safe and useful alternative to the transfemoral approach. J Invasive Cardiol 2000;12:292-6. Saito S, Tanaka S, Hiroe Y, Miyashita Y, Takahashi S, Tanaka K, et al. Comparative study on transradial approach vs. transfemoral approach in primary stent implantation for patients with acute myocardial infarction: Results of the test for myocardial infarction by prospective unicenter randomization for access sites (TEMPURA) trial. Catheter Cardiovasc Interv 2003;59:26-33. Karrowni W, Vyas A, Giacomino B, Schweizer M, Blevins A, Girotra S, et al. 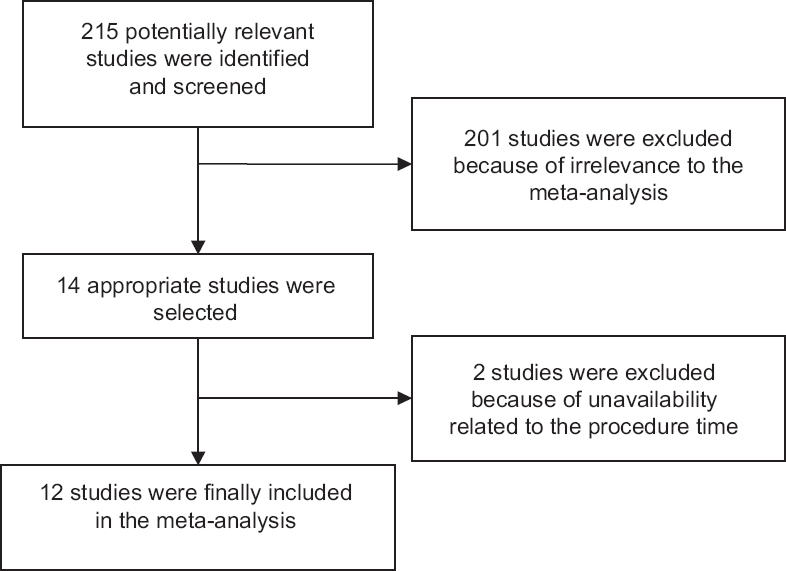 Radial versus femoral access for primary percutaneous interventions in ST-segment elevation myocardial infarction patients: A meta-analysis of randomized controlled trials. JACC Cardiovasc Interv 2013;6:814-23. Moher D, Cook DJ, Eastwood S, Olkin I, Rennie D, Stroup DF. Improving the quality of reports of meta-analyses of randomised controlled trials: The QUOROM statement. Quality of reporting of meta-analyses. Lancet 1999;354:1896-900. Hozo SP, Djulbegovic B, Hozo I. Estimating the mean and variance from the median, range, and the size of a sample. BMC Med Res Methodol 2005;5:13. Cantor WJ, Puley G, Natarajan MK, Dzavik V, Madan M, Fry A, et al. Radial versus femoral access for emergent percutaneous coronary intervention with adjunct glycoprotein IIb/IIIa inhibition in acute myocardial infarction – the RADIAL-AMI pilot randomized trial. Am Heart J 2005;150:543-9. Brasselet C, Tassan S, Nazeyrollas P, Hamon M, Metz D. Randomised comparison of femoral versus radial approach for percutaneous coronary intervention using abciximab in acute myocardial infarction: Results of the FARMI trial. Heart 2007;93:1556-61. Li WM, Li Y, Zhao JY, Duan YN, Sheng L, Yang BF, et al. Safety and feasibility of emergent percutaneous coronary intervention with the transradial access in patients with acute myocardial infarction. Chin Med J (Engl) 2007;120:598-600. Yan ZX, Zhou YJ, Zhao YX, Liu YY, Shi DM, Guo YH, et al. Safety and feasibility of transradial approach for primary percutaneous coronary intervention in elderly patients with acute myocardial infarction. Chin Med J (Engl) 2008;121:782-6. Chodór P, Krupa H, Kurek T, Sokal A, Swierad M, Was T, et al. RADIal versus femoral approach for percutaneous coronary interventions in patients with acute myocardial infarction (RADIAMI): A prospective, randomized, single-center clinical trial. Cardiol J 2009;16:332-40. Hou L, Wei YD, Li WM, Xu YW. Comparative study on transradial versus transfemoral approach for primary percutaneous coronary intervention in Chinese patients with acute myocardial infarction. Saudi Med J 2010;31:158-62. Chodór P, Kurek T, Kowalczuk A, Swierad M, Was T, Honisz G, et al. Radial vs femoral approach with StarClose clip placement for primary percutaneous coronary intervention in patients with ST-elevation myocardial infarction. RADIAMI II: A prospective, randomised, single centre trial. Kardiol Pol 2011;69:763-71. Wang YB, Fu XH, Wang XC, Gu XS, Zhao YJ, Hao GZ, et al. Randomized comparison of radial versus femoral approach for patients with STEMI undergoing early PCI following intravenous thrombolysis. J Invasive Cardiol 2012;24:412-6. Bernat I, Horak D, Stasek J, Mates M, Pesek J, Ostadal P, et al. ST-segment elevation myocardial infarction treated by radial or femoral approach in a multicenter randomized clinical trial: The STEMI-RADIAL trial. J Am Coll Cardiol 2014;63:964-72. Romagnoli E, Biondi-Zoccai G, Sciahbasi A, Politi L, Rigattieri S, Pendenza G, et al. Radial versus femoral randomized investigation in ST-segment elevation acute coronary syndrome: The RIFLE-STEACS (Radial Versus Femoral Randomized Investigation in ST-Elevation Acute Coronary Syndrome) study. J Am Coll Cardiol 2012;60:2481-9. Koltowski L, Filipiak KJ, Kochman J, Pietrasik A, Rdzanek A, Huczek Z, et al. Access for percutaneous coronary intervention in ST segment elevation myocardial infarction: Radial vs. femoral – A prospective, randomised clinical trial (OCEAN RACE). Kardiol Pol 2014;72:604-11. Campeau L. Percutaneous radial artery approach for coronary angiography. Cathet Cardiovasc Diagn 1989;16:3-7. Kiemeneij F, Laarman GJ. Percutaneous transradial artery approach for coronary palmaz-schatz stent implantation. Am Heart J 1994;128:167-74. Cantor WJ, Kaplan AL, Velianou JL, Sketch MH Jr., Barsness GW, Berger PB, et al. Effectiveness and safety of abciximab after failed thrombolytic therapy. Am J Cardiol 2001;87:439-42. Louvard Y, Krol M, Pezzano M, Sheers L, Piechaud JF, Marien C, et al. Feasibility of routine transradial coronary angiography: A single operator's experience. J Invasive Cardiol 1999;11:543-8. Louvard Y, Pezzano M, Scheers L, Koukoui F, Marien C, Benaim R, et al. Coronary angiography by a radial artery approach: Feasibility, learning curve. One operator's experience. Arch Mal Coeur Vaiss 1998;91:209-15. Hamon M, Pristipino C, Di Mario C, Nolan J, Ludwig J, Tubaro M, et al. Consensus document on the radial approach in percutaneous cardiovascular interventions: Position paper by the European Association of Percutaneous Cardiovascular Interventions and Working Groups on Acute Cardiac Care** and Thrombosis of the European Society of Cardiology. EuroIntervention 2013;8:1242-51. Pang J, Zhang Z, Yang YJ, Li N, Bai M, Peng Y, et al. The efficacy and safety of transradial percutaneous coronary intervention vs transfemoral percutaneous coronary intervention for ST-segment elevation myocardial infarction patients: A meta-analysis. Int J Cardiol 2014;177:483-8.